With the Dixie Narco Live Display 501E the customer can see exactly what can or bottle drink he is purchasing. Refurbished Dixie Narco 501E Live Display With the new Dixie Narco 501E Live Display in place, the customer can now see what they are paying for. 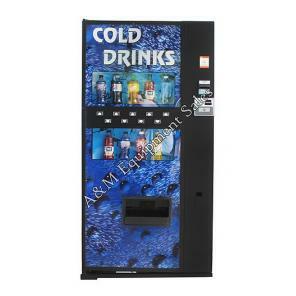 The Dixie Narco 501E Live Display Drink machine is a great indoor machine. With the customer looking at the actual cans and bottles they want to purchase the customers is being pulled towards the machine like bees to honey. When we say refurbished, we mean a vending machine that is as good as new. 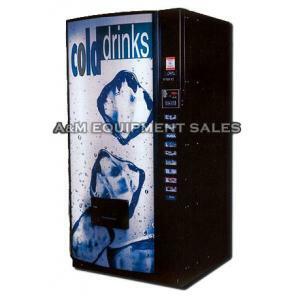 We aren’t doing the lip service only to sell our vending machines but, as our customers are our first and foremost priorities, we make sure when you take home our vending machines, you get only revenues and satisfaction. Dixie Narco 501E Drink machine live display Can/Bottle is able to vend Monster Energy Drink, 12oz cans, 16oz and 20oz bottles. Capacity 471 Cans or 278 Bottles (approx.). Comes with remanned validator and changer. An optional new changer and bill acceptor package can be purchased for $309.00 and comes with a two year warranty. Will vend Monster Energy Drink, 12oz cans, 16oz and 20oz bottles. New lexan live display sign, paint, new lock and keys, your choice of flavor strips, prices and make our machines look new. Every machine goes through our rigorous refurbishing process. CFC-Free, Lint tolerant, 1/3 HP refrigeration system. Dimensions: 72″H x 37″W x 33″D, shipping weight 897 lbs. Warranty 90 days parts. Shipping not included. Telephone support available Monday – Friday 8:00am – 5:00pm EST as long as you own the machine. Remanufactured by A&M Equipment Sales see our remanufacturing process.